Our sample SDS is perfect to help you and your employees become familiar with the GHS aligned format. Health Canada began aligning the Workplace Hazardous Materials Information System (WHMIS) with GHS in 2015, resulting in several changes to hazard communication requirements for manufacturers, distributors and employers. Under WHMIS 2015, safety data sheets will now need to adhere to a prescribed, strictly ordered 16-section format. Although the name has changed from MSDS to SDS, the purpose of the document remains the same. 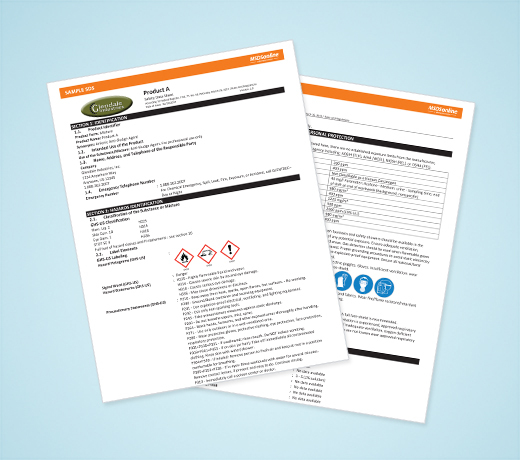 A safety data sheet still serves as the linchpin to your hazard communication program, providing your employees with comprehensive safety information about hazardous chemicals in their workplace, aiding in chemical inventory management, and connecting the dots to container labels and other forms warnings in the workplace. Our sample WHMIS SDS is perfect to help you and your employees become familiar with the GHS-aligned format.